On Tuesday, the members of the Iraqi electoral commission IHEC collectively presented their resignations to the head of the commission. If the mass resignation becomes effective, it will leave Iraq without the required institutional framework to carry out parliamentary elections scheduled for 30 April. First a word on the legal aspects of the resignations. It has been suggested by both Sadrists and ISCI leader Ammar al-Hakim that the resignations are subject to approval by the Iraqi parliament. This view does not seem to square with law no. 11 from 2007 that regulates the work of the commission. In article 6, first, it is stipulated that the membership of commissioners can be terminated upon presentation of a resignation according to the bylaws of the commission. There is no mention of parliament at all. The bylaws of IHEC, adopted in 2013 (PDF here, starts on p. 21), stipulate that any member can present their resignation to the commission and that it will become effective after 30 days unless other action is taken. The collective resignation presented to the head of the commission does seem somewhat unorthodox in that respect, but there seems to be no doubt that legally the matter remains within the commission itself. As for the substantive context, it is fairly clear that the resignation of the IHEC members comes as a response to the latest legislative action by the Iraqi parliament. This aimed at enshrining a particular interpretation of the Iraqi election’s law concept of “good conduct” as a criterion for election candidacies. Specifically, through its focus on the presumption of innocence parliament effectively negated IHEC’s past practice of using multiple legal charges against an individual (without conviction) as basis for banning them from standing in elections. 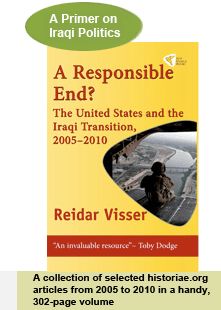 Of course, to what extent it is within the power of the Iraqi parliament to adopt a simple “decision” in order to rectify the vagueness of its own past legislative efforts is open to debate. In the past, such decisions have materialized from time to time, for example in December 2009 when it was used to enshrine the exact distribution of seats between provinces (conversely, in November 2013 when the new election law was passed, an attachment to the law itself stipulated the seat distribution). Conceivably, a more correct (but more time-consuming) method for challenging what is perceived as IHEC highhandedness in banning election candidates would be to complain the procedures to the administrative court (rather than the supreme court), which deals with the application of laws in force, and which could in theory address the methods used to determine what constitutes “good conduct”. In any case, the comparable parliament “decision” from 2009 on seat distribution was adhered to, of course, not least because it reflected a consensus that had emerged after months of parliamentary wrangling. This time things are very different. It is fairly clear that the parliament action to define “good conduct” was taken by enemies of Prime Minister Nuri al-Maliki in parliament (chiefly the bloc of parliament speaker Nujayfi along with some Shiite discontent support) who were concerned about possible collusion between the PM and the Iraqi judiciary in excluding political enemies from the next elections. For his part, Maliki has responded to the parliamentary move by questioning its legal status, describing it as an “incomplete” legislative act, thereby evoking past supreme court rulings that basically stipulate that every legislative act in Iraq should pass through the cabinet before becoming law. Reflecting the changing political colour of the commission seated in September 2012, thought to be more favourable to Maliki than the previous one, IHEC has implicitly come out on the side of Maliki in this debate. (Possibly due to laziness, some pundits have construed the current conflict as a case of IHEC standing up against Maliki: They should carefully study the chronology of events and how the recent parliament decision immediately prompted an IHEC escalation, as well as this interview with one of the commission members, which at one point goes far in criticising parliament interference with the electoral judicial panel). The decision by parliament itself should be appealable to the federal supreme court as a matter of constitutional interpretation. Indeed, if Maliki wants to avoid speculation that he is sincere about having elections on time, he should probably file such a complaint in any case. In all of this is it is noteworthy how the battle lines have changed somewhat from 2010, when there was also a pre-election struggle related to candidacy qualifications. Back then, the struggle related to de-Baathifcation, and the tension increasingly took on a sectarian nature. So far, despite heightened sectarian tension regionally, de-Baathification has been in the background this year, with the MPs complaining about exclusion from the upcoming elections representing both Sunni and Shiite-leaning political parties. But the elections lists must be published soon if there is to be any time left for campaigning, and there could of course be surprises hidden in them. All in all, Iraq is beginning to look dysfunctional. The president is incapacitated, the annual budget has not been passed, and now the threatened IHEC resignation. And yet there is something quintessentially Iraqi about resignation threats – a staple of Iraqi politics since the days of the British mandate. It will be remembered that half of the Sunni and secular politicians in parliament recently threatened to resign without following through. There may still be possibilities for compromises ahead of 30 April, but time is fast running out. Following a session on Sunday featuring MPs supportive of PM Maliki’s moves to pass the annual budget ahead of 30 April elections, the Iraqi parliament today brought together a group of MPs critical of Maliki. In a symbolically important move, the assembly passed a measure of interpreting the elections law that effectively challenges Maliki’s use of the Iraqi judiciary to bar political enemies from standing in the elections. The move in itself represents a somewhat ambiguous parliamentary act, referred to in the official parliamentary proceedings as a “legislative decision” (qarar tashriyi). Its essence involves a more specific interpretation of article 8, third, of the new Iraqi elections law that was passed in late 2013. That law, like previous laws, had vaguely specified that candidates must be known to be of “good behaviour” or “good standing”. In practice this has been used until now to disqualify candidates for whom arrest orders may exist. (Maliki aide Tareq Harb has provided a wonderful exegesis of how this works in practice: One arrest order or charge does not suffice, but where there are multiple orders this is used to disqualify!) The parliament decision today is emphatic that an actual conviction must have ensued for there to be legal grounds for barring a candidate. Essentially, the message from the Iraqi parliament is that, until a court of law has considered the case, statements by the Iraqi prosecution or police are of no relevance as far as the candidature of an individual is concerned. The decision today specifically refers to the presumption of innocence, stressing that an individual is innocent until proven guilty. This point is worthy of repetition after a series of politically tainted prosecution attempts. Still, it should be mentioned that the decision today appears to be the direct result of the fact that several existing MPs were themselves attempted barred from the elections, a fact which the official parliament record actually quotes. The number of deputies supporting the motion – 165 – is interesting. It is more or less the same as the 164 deputies who supported the first reading of the annual budget on Sunday in a move seen as pro-Maliki. The 325-member Iraqi parliament is in another words divided in two halves, with at least a handful of deputies wavering between the two camps. The parliament session today concluded with adjournment “until further notice”. Parliament speaker Nujayfi may be able to effectively filibuster the meetings of the assembly in this way, but it will be increasingly difficult for him to explain to the Iraqi public why no parliament meetings are being held and why parliament is not fulfilling its constitutional duty to pass the annual budget. The absence of political consensus is not an argument since there is no constitutional requirement that decisions be passed with consensus. A key question going forward is whether the deputies seen to be wavering between the Maliki and Nujayfi camps this week will move more decisively one way or another over the coming period.